The best thing you can do for your upholstered furniture and window treatments is to vacuum them frequently! Removing surface dust will keep it from settling into the fabric to take up residence--where it is likely to react with anything spilled on the fabric to make a stain even worse. Use the small brush attachment on your vacuum cleaner--and if it’s not very clean, you can wrap it in cheesecloth and secure with a rubber band to protect the fabrics. MOST DECORATIVE FABRICS ARE NOT DESIGNED TO BE WASHED. If you own a beautiful suit, you wouldn’t toss it into the washing machine for the following reason: when fabrics have been made into a finished product with lining, welting, crinoline and/or trims, they should never be washed because each product will react differently to washing and drying. If an item needs to be cleaned, call in the professionals--or if small enough, take it to a dry cleaner. Sensuede® faux suede fabrics; Sunbrella® indoor/outdoor fabrics; Bella-Dura® fabrics, and other 100% acrylic or 100% spun polyester prints for indoor/outdoor use. Finally, some polyester sheers with rod-pocket headings (no crinoline, no hooks) can be hand-washed in a bathtub with a mild detergent. 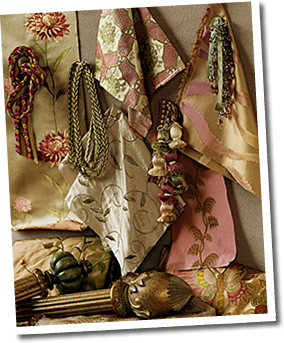 See specific areas of this brochure for additional information on these fabrics. Calico carries many easy-care high performance fabrics perfect for families with sticky-fingered kids or pets with dirty paws. And most of our regular fabrics have been pre-treated with stain repellent finishes. So enjoy your fabrics. And when it’s time to redecorate, we hope to see you again! Most upholstery fabrics sold at Calico have already been treated with DuPont™ Teflon® fabric protector or another stain repellent finish applied by the manufacturer. The exceptions are fabrics that have been laundered for an ultra-soft hand, as the process of applying the stain repellent would press the fabric and change the hand. Teflon® fabric protector provides an invisible molecular barrier around the individual fibers of the fabric. Most liquid spills will bead up on the surface for easy blotting before a stain is created. Please note that "stain repellent" does not mean "waterproof." In addition, the effectiveness of these stain repellents is reduced by normal wear and abrasion. Fabrics do fade or wear out eventually; they are not indestructible. However, most fabrics sold at Calico are from reputable jacquard mills and print houses. We take pride in the quality of our fabrics--and we will stand behind them. Over the years we’ve found that by the time most fabrics are fading, you’ve probably tired of them and are ready to move on to something new in a fresh color. (One mistake some customers make is to recreate or reupholster a piece in the same color or fabric as it was--and then it doesn’t look as if anything has changed when you get it home)! Many customers think that the reason there is a zipper in the back of sofa or chair cushions is so that the cover can be removed for cleaning--not so!The zipper is to make it easy to stuff the cushion filling into the fabric cover--not to remove it. The zipper can be handy for access to the underside of the fabric, if cleaning agents are being applied to the surface. Cushion covers of upholstered chairs or sofas should never be removed for cleaning or washing --they will look different from the rest of the piece after cleaning--and they may shrink, too. Furniture seat and back cushions should be flipped and rotated periodically for more even wear.This will also balance exposure to the sun. When spills occur: using a gentle touch, carefully blot up any spills with a towel.Do not rub frantically, as this will drive the stain further into the weave of the fabric, making it even more difficult to remove. If the spilled substance is a thick product, i.e. mud, let it dry before prying off and brushing off any residue. Contrary to popular belief, club soda is not a miracle cure. It has the same properties as water--no more, no less--and it might make things worse by causing the dyes in the yarn to bleed. If your upholstered furniture requires cleaning, please call a professional service. They carry special cleaning agents, know how to apply them, and know how to prevent leaving a "clean spot." Having an extra yard or two of upholstery fabric on hand is relatively inexpensive insurance in the event of small disasters. Indelible stains need not doom an entire piece if a new cushion cover can be made or an arm recovered. Some Calico customers buy enough fabric to recover their ottomans twice, knowing they will need to be reupholstered more frequently than the chair or sofa. The following applies to any fabric with Cleaning Code "S," such as most cotton, cotton/rayon or decorative jacquard upholstery fabrics sold at Calico (the "S" stands for solvent). These types of fabrics should NOT be cleaned with water, club soda or water-based upholstery shampoos or cleaners. They may cause shrinkage or may create permanent water stains that cannot be removed without solvent cleaning agents. For spot cleaning, use a mild water-free pure solvent (such as Carbona or Renuzit) and work in a well-ventilated room. Avoid any product containing carbon tetrachloride, as it is highly toxic. Always pre-test cleaning agents on a hidden area. Wait until the fabric dries to see if there is any change before proceeding. Solvents must be properly used or there may be a "clean spot" or a noticeable ring left on the fabric. Before beginning, assemble solvent, white cotton or paper towels and a hairdryer. Place cotton or paper towels beneath the stain (if possible), then quickly daub on the solvent using a clean white rag or towel. Dry immediately with the hairdryer to reduce the chance of the dyes running or leaving a clean spot. If the fabric is velvet or faux suede, a very soft brush (such as a baby’s hairbrush) can be used for brushing the nap on these fabrics while cleaning. First, remove the window treatments from the rod. Then remove all drapery pins--this is critical! Without washing or dry cleaning the draperies, place one panel at a time into the dryer. If multiple widths are seamed together, a large capacity commercial dryer may be preferable. Next, add an old, dry cotton terrycloth bath towel. The cotton towel will absorb grime that is released in the tumbling action. 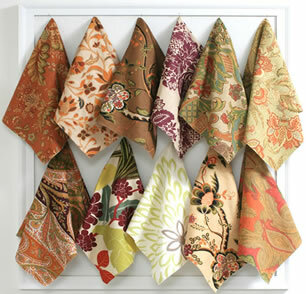 Remove panels immediately and hang on skirt hangers or rehang at the window. Rumples should hang out, but ironing or steaming may be necessary to make wrinkles disappear. Even if an installer is called for professional steaming, the total cost will be a fraction of the expense for professional dry cleaning. "My towel was positively filthy when I took it out!" exclaimed one Calico customer, amazed at how much dirt had been released from her draperies. This technique is much more gentle on fabrics than exposure to strong dry cleaning chemicals--which may cause linings to shred when they have been weakened by exposure to the sun and the elements. 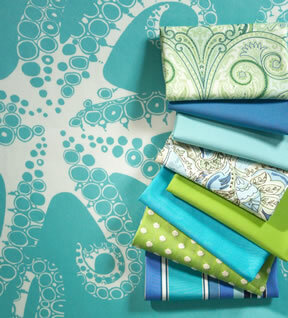 Cotton is the most widely used fiber in decorative fabrics--and for good reason. It can be soft and casual or lustrous and elegant. Cotton blends beautifully with other fibers, including synthetics. Cotton is also abrasion resistant and releases soil readily. You’ll find cotton in all weights of fabrics, from translucent sheers to sturdy upholsteries. Calico recommends that almost all decorative cotton fabrics be professionally cleaned. Although cotton is often washable, there are three good reasons NOT to wash decorative fabrics of 100% cotton or cotton blends: first, shrinkage may occur; second, washing may affect the dyes used to create the fabric; and third, washing may remove some of the finish, changing the hand and appearance of the decorative fabric. Stain repellent finishes are also diminished by washing. Other finishes may also be affected--such as those on cotton warp-sateen fabrics (or "polished cottons"), calendered (glazed) finishes, moiréd or napped finishes. In other words, although the item may be technically washable, you may not be pleased with the look of the fabric after washing. The one exception to the no-washing guideline for cottons is if you want a relaxed, casual, slightly wrinkled look for unlined bed coverings or slipcovers--and if you don’t care if the fabric fades a bit or loses some of its stain repellent features. Linen, the oldest textile fiber, comes from the stem of the flax plant. Linen is a versatile natural fiber that adds wonderful texture and a great deal of strength to a fabric. It also has a tendency to wrinkle, as you well know if you’ve ever worn a crisp linen shirt on a summer day (a sign of real linen). Linen is often blended with cotton or rayon for easier care. Linen is noted for its strength, slubbed texture, resistance to sun rot and lack of pilling problems. Linen window treatments should be drawn with a wand or a cord to prevent wrinkling, rather than handling the fabric directly. Silk should be professionally cleaned or dry cleaned only. Spot cleaning is not recommended and using water may leave a permanent water spot. If using silk on chairs, we recommend pre-treating with a stain repellent product, as spills may be difficult to remove later. 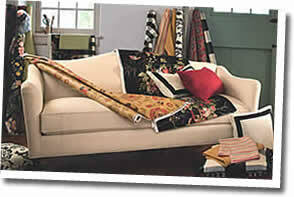 (Note: upholstery weight silks from Calico may already have a Teflon® stain repellent finish). Silk drapery panels should always be lined, and preferably interlined, for protection against sun damage. Window treatments of silk should be gently vacuumed regularly to keep dust off the surface of the fabric. 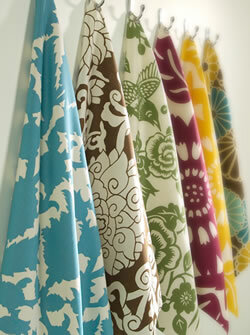 When installing silk drapery panels, allow them to hang for a few days and most creases will disappear naturally. If silk drapery panels must be pressed, use the low heat silk setting on the iron and place on a soft, cloth-covered ironing board. Avoid using steam. Some silks are woven to be upholstery-weight and do not require a backing (or already have one). When using lightweight silks for upholstery, a knit backing should be applied unless the furniture is seldom used. Embroidered silks with a raised design element will pucker when backed and are not recommended for upholstery use. Many silks have slubbed yarns (often found in dupioni and raw silk textures). These are not weaving flaws; they add texture and visual interest to silk fabrics. For stubborn stains, add bleach to the soap and water solution, or use a fabric spot remover. Sunbrella® acrylic fabrics are not damaged by bleach (although bleach is not recommended for printed acrylic fabrics — see below for more information). Removable cushion covers or tableskirts may be machine-washed using cold water and mild soap, then air-dried. Occasionally mildew is found on outdoor cushions of Sunbrella®--however, it’s not the fabric that has mildewed, but the soil that is on the fabric or cushion. This can also be removed with a bleach solution and a soft brush. Always rinse thoroughly and air-dry. To prolong the life of the fabric, we recommend removing outdoor cushions from direct sunlight and other elements when not in use. Brush off dirt before it becomes enmeshed in the fabric and clean up spills right away. Sunbrella® products are fade-resistant and should last for several years without fading. Outdoor cushions can also be made with fast-draining marine foam if they will remain outside for long periods (available at Calico). Please note that Sunbrella® fabrics are water repellent, not waterproof. Occasionally, acrylic fabrics will pill--however, these little fuzz balls can be removed with a sweater shaver, and once removed, they won’t return. All of the fabrics in our Casual Living Collection are suitable for heavy-duty upholstery use. 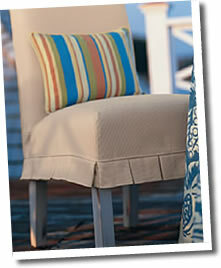 For more detailed information on how to clean Sunbrella® or how to treat specific stains, visit www.Sunbrella.com. There you'll also find information about renewing the special water repellent finish on Sunbrella® fabrics. Prints of 100% acrylic or 100% spun polyester are naturally soil and stain resistant. Stains can usually be removed with a mild soap-and-water solution. Do not use bleach on printed acrylic fabrics, as it will fade the printed pattern. 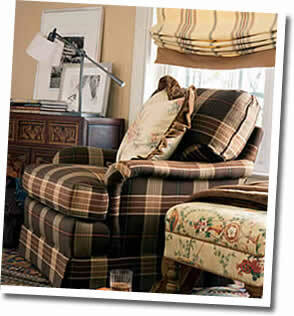 To prolong the life of the fabric, remove outdoor cushions from direct sunlight and other elements when not in use. Turn cushions regularly for more even wear and exposure to the sun. The base of the print, either acrylic or polyester, is fade-resistant and should last for several years without significant fading. The printed pattern that is applied to the base cloth with special dyes for outdoor use is also fade resistant, but needs protection from the sun and elements in order to keep its vibrancy. Outdoor cushions can also be made with fast-draining marine foam if they will remain outside for long periods (available through Calico). Many manufacturers of outdoor woven fabrics (other than those that make Sunbrella®) use 100% Solution Dyed Acrylic or 100% Polyester. These fibers are inherently fade resistant and can be cleaned using a mild soap and water solution. We do not recommend using bleach on these products, as we cannot guarantee the results. To prolong the life of the fabric, we recommend removing outdoor cushions from direct sunlight and other elements when not in use. Turn cushions regularly for more even wear and exposure to the sun. These fabrics are rated for 750 hours of sun exposure, or about 125 to 200 days depending on where you live. Even fabrics used in sunrooms or under porches are subject to sun exposure and fading. Outdoor cushions can also be made with fast-draining marine foam if they will remain outside for long periods (available through Calico). Please note that outdoor fabrics are water repellent, not waterproof. Occasionally, acrylic fabrics will pill—however, these little fuzz balls can be removed with a sweater shaver, and once removed, they won’t return. All of the fabrics in our Casual Living Collection are suitable for upholstery use. This elegant faux suede is resistant to spills and stains and a perfect choice for dining room chairs or other areas that may be subject to spills of food and drink. Vacuum Sensuede regularly to remove dust and grime from the surface of the fabric. Most spills will bead on the surface of Sensuede and can be absorbed with a paper towel before leaving a residual stain. If a stain does occur, spills can be removed with a sponge soaked in some warm soapy water, then blotted with a dry towel. 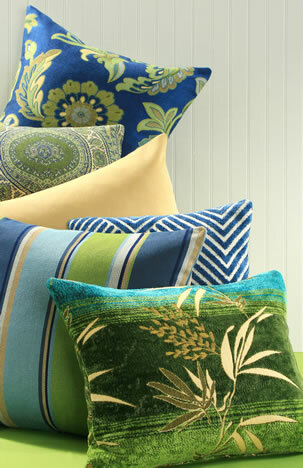 For cushion covers that can be removed, Sensuede can be gently washed in cool water with a mild detergent. Do not bleach and do not dry at a high temperature in the dryer. 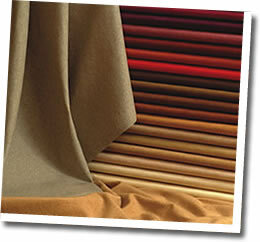 When dry, brush the fabric with a suede brush to restore the natural sheen and luster of the fabric. If ironing is required, iron on the reverse side using a cool setting. These care instructions apply only to products made solely of Sensuede. 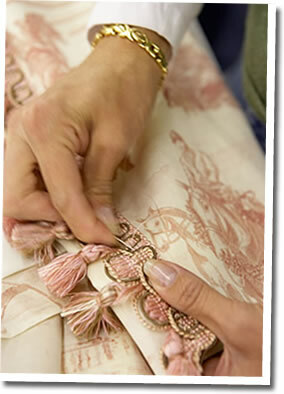 Fabricated items that contain other fabrics or trims cannot be machine-washed. Use a professional cleaning service or spot removal techniques instead. Leather requires very little maintenance. Occasional dusting with a dry cloth is all that is necessary to clean and maintain it. Do not use commercial saddle soap, oils or cleaners on this leather. These products are not made for upholstery leather and may actually harm it. Spills should be wiped up immediately, since acidic or alcoholic liquids may damage the protective coatings over time. If cleaning of a soiled area is needed, gently apply a mild soap and water solution with a clean cotton cloth. Follow by wiping with a damp, clean cloth, being careful not to over-saturate the leather. 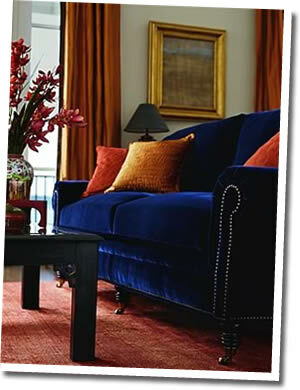 Velvet and mohair offer special cleaning challenges because of the pile and nap of the fabric. The pile consists of short yarns woven into the backing fabric; this creates the plush surface of velvet and mohair. The nap refers to the direction of the pile. On furniture, the nap should run down on seat backs and toward the front on seat cushions; this aligns with how our bodies move when we sit down and get up. The fabric will wear better if the nap is running in the right direction. Velvet upholstery responds well to damp fluffing and brushing, a light professional cleaning technique. One manufacturer recommends treating velvet fabrics with solvents (Cleaning Code "S"), found under DO-IT-YOURSELF CLEANING TECHNIQUES. Clean as large an area as possible to avoid leaving rings or a "clean spot." Note that the color of velvet or mohair will appear to change depending on the direction of the nap--so be sure to look at the fabric from the right angle with this in mind. Mohair velvet is unusually durable if properly maintained--just look at the Art Deco era antiques that are still clad in their original upholstery! Professional cleaning is recommended for these fun fabrics. Shake or vacuum regularly to keep dust from settling into the fabric. Keep faux fur away from any source of heat. Do not iron or steam.